Before fast food, there was street food. 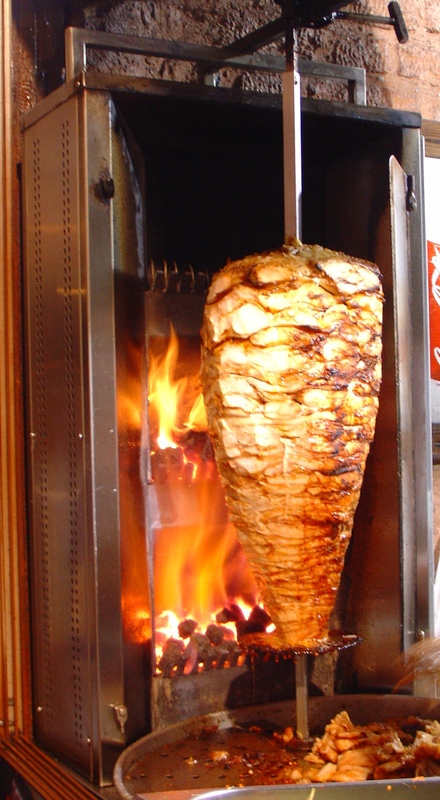 One of the most prolific street food items throughout the Middle East is the kebab, a flatbread sandwich filled with meat sliced from a rotating spit. 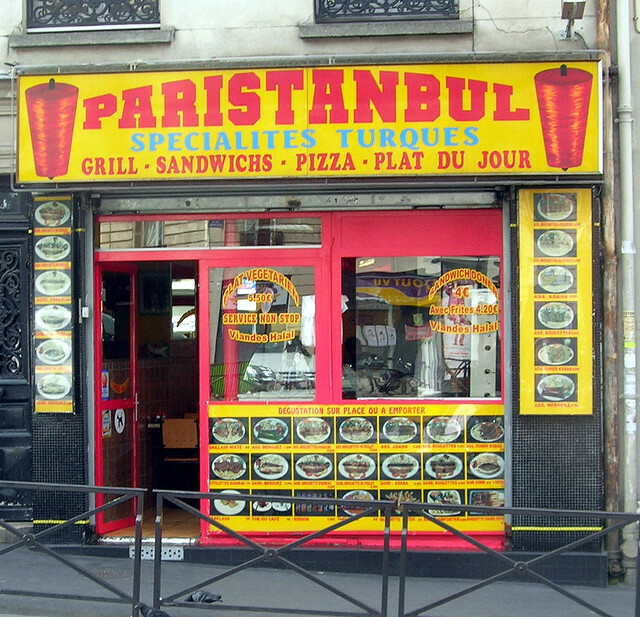 If you’ve been to Europe since 1990 (and perhaps found yourself out at a late hour with one too many drinks in your system) you are probably familiar with the kebab, sold from tiny shops stuck in between electronics stores and Laundromats, displaying that golden tower of slowly rotating mystery meat prominently in the front window. 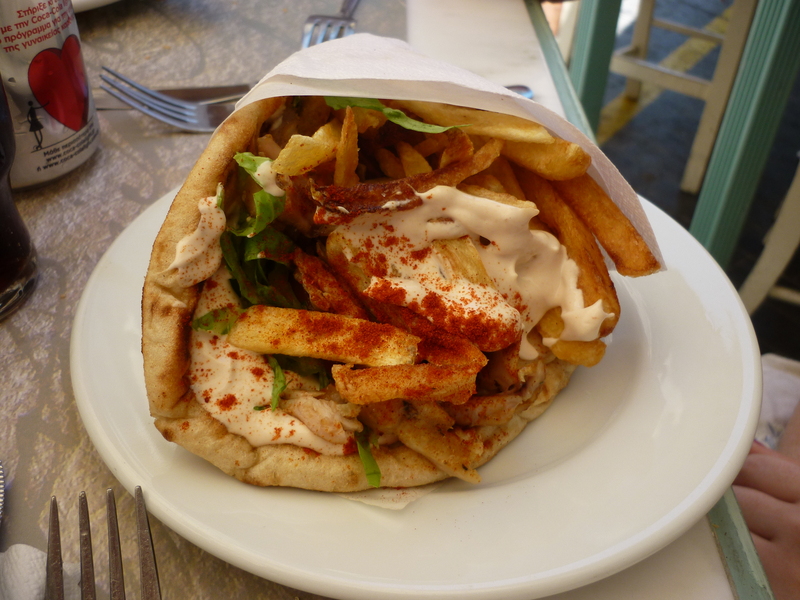 I have grown to love the Parisian Kebab, the majority of which are Turkish and come with a generous pile of frites stuffed into the center and smothered in a mayonnaise-based white sauce, modifications that have acted as a sort of “hybridization” to appeal to French customers. Like pizza and now the hamburger, kebabs have grown in popularity and shops have grown in number as globalization intensifies the flow of cultures, people, and objects throughout the world. 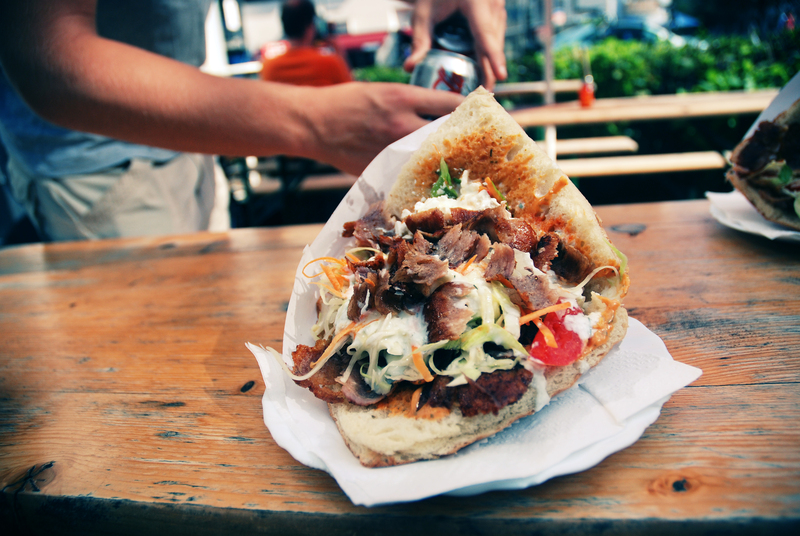 But unlike pizza or hamburgers, both of which have been normalized, accepted, and even embraced in French culture, the kebab is a point of contention among political elites. Arguably, the hamburger is a two-sided coin: while bistros and brasseries now serve versions that run up to 14€ or more, the infamous “McDo’s” version has been criticized roundly by the French, lead by France’s most famous food activist-farmer-politician, José Bové. Wild protests have surrounded the invasion of McDonald’s, its food, its imitators, and all it represents; but this does not stop the French from dispensing more than half of restaurant spending on fast food. The institution of McDonald’s may have been hated as a representation of American cultural and economic imperialism, but the hamburger emerged triumphant and went on to be duplicated and celebrated throughout the country. So what happened with the kebab? While there are hundreds of kebab shops throughout Paris and its surrounding “banlieues” (suburbs), provincial regions in the south are just now experiencing an influx of different cultural cuisines. Blois, a town in the Loire Valley famous for its castles and wine, now has over a dozen kebab shops; according to Newsweek, in response to this development a representative of the French far-right National Front party stated “The historical center of Blois, the jewel of French history, is turning into an Oriental city.” The message here is implicit: in the eyes of the French far right, kebabs are altering the landscape of historic, traditional France…and not for the better. As with so much else, food here acts as a thinly masked vehicle for political commentary. Islam has been an especially controversial subject in France over the past decades, with heated political debate most recently relating to the headscarf debate and subsequent laws banning it in certain settings. After this law passed, violent riots broke out in the suburbs of Paris in 2005, and again when it was reinforced in 2013. The kebab is in no way an implication or representation of Islam. It is merely a cultural artifact of countries in the Middle Each, those of which may or may not be Muslim. The political criticism of kebabs comes from a portion of France that is deeply uncomfortable with a changing French identity in the face of globalization, not so different from the intense resistance to American-style fast food. But like fast food, the French youth have fully embraced the kebab; this points to a shifting trend that makes National Front and other conservatives uncomfortable with France’s economic and cultural future. Just like other international cuisines, kebabs are now an integral part of the French culinary landscape; ultimately resistance to the integration of kebabs is a resistance to the integration of the people who make them. So what does the future hold for kebabs? Well, it doesn’t seem like they are going anywhere. In fact, popularity is growing; popular tourism and food-based websites and blogs (Time Out Paris, TripAdvisor) are compiling their own lists of top kebabs in Paris, and there have even been websites dedicated for the sole purpose of scouting out kebabs. Food writer, television personality, and chef Anthony Bourdain lists one kebab in particular as an essential must-eat while in Paris. In London, the kebab trend is being upgraded as new “posh” kebab shops open up. This points not only towards acceptance and embracement of the kebab, but a complete capitalization of it. Will France follow suit, or will its few narrow-minded political representatives shift public opinion in any way? Posted on November 25, 2014 November 25, 2014 by srchristofferson	This entry was tagged assimilation, cuisine politique, doner kebab, fast food, food politics, France, france and the middle east, french far right, French food, french immigration politics, french politics, Front National, globalization, headscarf, immigration, integration, international cuisine, international food, islam, kebab, Loire Valley, McDonald's, middle east, middle eastern politics, muslim, Paris, street food. Bookmark the permalink.